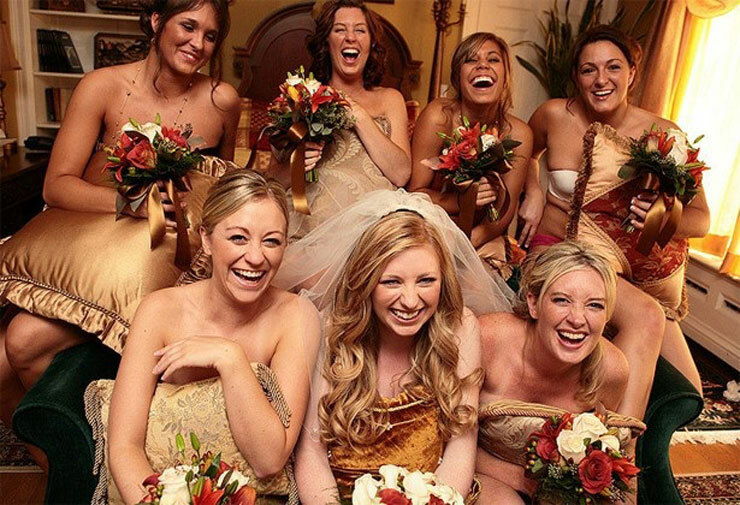 The bridal shower is a party for the bride, typically 4-6 weeks prior to her wedding, hosted by the maid of honor. The custom derives from earlier times when a bride's father had to provide a dowry. If a father was too poor for a dowry or unwilling to provide one, gifts from friends would compensate for the dowry and allow the bride to marry the man of her choice. In modern times, bridal showers are an afternoon function where the bride's mother, grandmother, and friends are invited to attend. Presents are tame and typically come off the bride's registry – dishware, flatware, tea, towels. 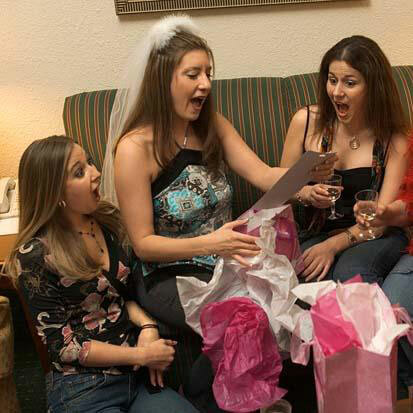 Racier gifts like lingerie or edible underwear are typically reserved for the bachelorette party. If the bride has a far reaching group of friends and the guests are unlikely to know one another, an icebreaker provides a nice introduction. If a lot of people attend, icebreakers can be a bit too long, so consider center the icebreakers only on the bridesmaids. In this icebreaker, a woman makes three statements – two are true and one is a lie. I performed the vocals for Ariel in the German version of The Little Mermaid. I lost my virginity at a drug rehab clinic. I was Miss October in a pinup calendar sold for charity. The others guess which statement is a lie. You can keep score in this game and the person who gets the most answers correct wins a prize. Or you can keep it light and informal, with no score tally. Have participants write down their two truths and a lie so they're reading it from a script, rather than speaking on the fly. This will allow them to pay attention to others who are speaking, rather than worrying about what they're going to say when it's their turn. To add a little more flavor, have guests write their names on the three statements then redistribute them so that someone else reads their script. Get a large beach ball and a thin permanent marker. Write several questions (about 80) on the beach ball. Have a group stand in a circle and toss the ball from person to person. Each time a woman catches the ball, she has to say her name, read a question, and provide an answer. What are three words to describe the perfect kiss? If you could fight anyone, who would it be? If you were a stripper, what would be your stage name? If you don't feel like tossing a beach ball around a circle, you may modify this game by writing the questions on a piece of paper. Put all questions in a hat then pass the hat around the room. Pick a date that's significant to the bride (the date she met her groom, the date they went on their first date) and ask everyone to say what they were doing on that day. On August 10, 2005, the bride-to-be was on her first date with her future husband. Where were you on that day? Hello. I'm So-and-So. In August 2005 I was working for the Peace Corps in Southern Thailand. I was most likely sweating a lot and eating a mango. You can use holidays if you doubt people's ability to recall an interesting location or job they held during that time period. Ie: "In 2007, the bride-to-be spent her first Christmas with her future husband. Where were you that Christmas?" Or if they haven't been dating for too long, you can spice it up. "Three Christmases ago, the bride-to-be was doing x and had no idea she'd be marrying her future husband in three years. Where were you three years ago on Christmas?" Guests can play a variety of games at bridal showers – some corny, some sassy, and some so corny they end up being funny. Below are a few ideas. Make a bingo card with different shower gifts. Guests keep track while the bride opens presents. If they get a bingo, they win a prize. Split into teams and have each team wrap a person with toilet paper in the way they think the bride's dress and accessories will look. The bride chooses the winner. Ask the groom ten questions about the bride in advance. Then ask the bride the same questions and compare how their answers match. After all the attendees have arrived, ask each person to introduce themselves and offer a nugget of advice (how to have a happy marriage, cooking tip, love pointer, etc). Assign a secretary to record the tips. Compile it later as a gift for the bride. If either the bride or groom speak a second language, create a worksheet with two columns and have guests match the foreign phrase with the English translation. Phrases can include "Where's my dinner?" or "Is that a rash?" or "I love you." If neither partner speaks a second language, matching Chinese characters with English translations is always a hit. Hire someone to bring polygraph equipment and teach how it works. Always fun to learn about your mystic future. Hire a professional to conduct a wine tasting or teach you how to make the perfect cosmo. Hire a company to bring professional dealers and tables. Award prizes to the winners.